An artist’s rendering of Dr. George Robert Grasett Park at Adelaide Street West and Widmer Street. The Ireland Park Foundation expects to break ground on it on June 21. Imagine if an enormous surge of people, amounting to more than the city's population, many infected with the Ebola virus, arrived in Toronto today. It would be a colossal, harrowing crisis. Imagine that and hope, as human nature compels us to hope, that we would behave decently and take care of each other. It has already happened, that crisis, in a way. In the past, 170 years ago. A remarkable Toronto organization, the Ireland Park Foundation, expects to break ground on what will be called Dr. George Robert Grasett Park on June 21. Officials from the foundation, the city of Toronto, the province, the federal government and the government of Ireland will be there. All these bodies as well as private donors have supported the long, long work to know and learn about this city of 170 years ago, in the cataclysmic summer of 1847, and commemorate it. The past is an awkward place. We look on it and are bewildered by the actions of people whose motivations we can't really grasp. We wait for some narrative to emerge; some story of heroes and villains that makes sense to us in the here and now. Hopefully, there's an image, a picture or a statue of important people – celebrities, we call them today – that we can use to help focus on them. I'm an Irish-born immigrant, and like all others of my kind I know the past can be painfully awkward. History would be nice if it was a smooth, retrospective, linear narrative. But it never is. There are furies and hurts buried there that can't be grasped and never heal: Famine, betrayal; the breakdown of decency. Recently, while researching the piece I'm writing here, I read this report in the Montreal Witness, from July of 1847: "The immigrants are carrying their destitution and disease to every locality of Canada West into which they have yet penetrated." That's us, the Irish. The Great Famine was happening and the ravaged victims were arriving in Canada. Destitute, yes. Diseased, yes. 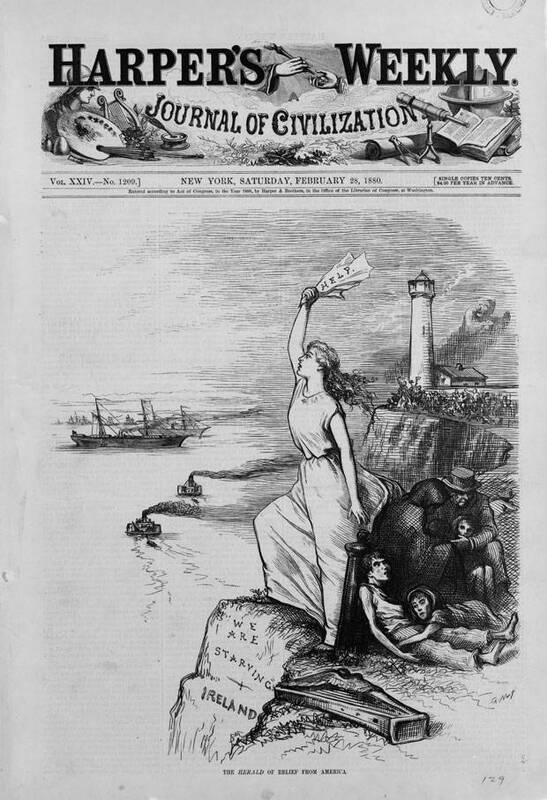 That same newspaper reports, "Wherever the immigrants go, even as far as Brantford, the inhabitants are complaining of the burden of pauperism and disease thrown upon them." Read that and you can smell the fear, the loathing, of us. In Toronto, the engine that drives the narrative of history is forward-looking, fiercely paced and suspicious of the past. The heroes and heroines are builders, doers and dominant personalities. Preferably their achievements are obvious today. But burrow down, back into Toronto's infancy as a growing, shifting city of endless waves of immigrants and there are people, forgotten mostly, whose actions we can understand today, instantly, for their unselfish endeavour and defiance of the dictates of authority, for their devotion to humanity and decency itself. 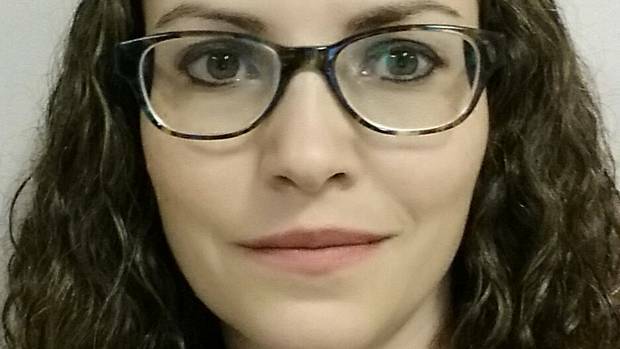 That report in the Montreal Witness mentioned such a person. "Dr. Grasset of Toronto, of whose benevolent efforts the papers speak most highly, has fallen a martyr to the duties as immigrant physician there. He died of the fever." That's Dr. George Robert Grasett (the newspaper spelled his name wrong) who died at age 36 in July, 1847. He died treating the sick Irish in what was the most cataclysmic, horrifying human crisis in the city's history. And soon a small handkerchief of downtown land at Adelaide Street West and Widmer will be used to honour him. Who was he and why is it necessary to mark his doings and his death? The way to find out is to start at the small tablecloth of land that is Ireland Park at the foot of Bathurst Street, and go back just a month. 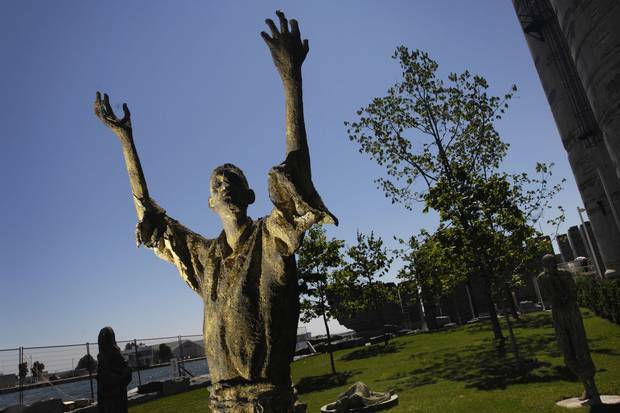 At Toronto’s Ireland Park, statues by Irish sculptor Rowan Gillespie represent the tens of thousands of Irish Famine victims who came to the city in the summer of 1847. For its organizers, the establishment of Ireland Park at the foot of Bathurst Street was a start, not an end. The foundation kept digging into the crisis of 1847, knowing it would resonate along with modern anxieties about refugees and immigration. The Ireland Park Foundation expects to break ground on June 21 for a second park, to be called Dr. George Robert Grassett Park. On a Friday in May at Ireland Park, there was ceaseless heavy rain and howling wind when Ireland's Prime Minister, the Taoiseach, Enda Kenny, came to visit. About 20 of us huddled there in a tent, waiting for him. There was hardly anyone else around. A young woman out for a jog paused, stared briefly, puzzled by the small crowd, and continued on. A couple walking their dog stopped and inquired about taking shelter with the small, gathered group. They were welcomed in. 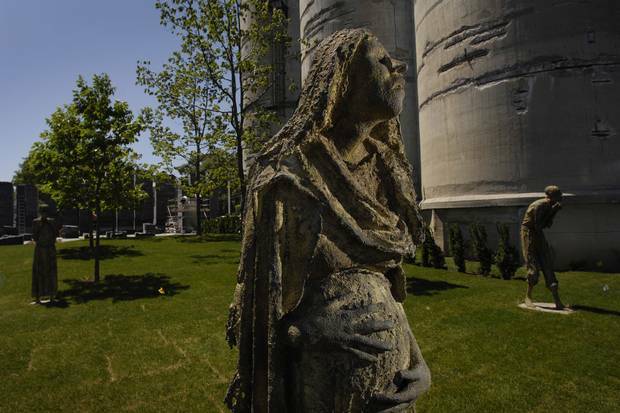 When Mr. Kenny arrived, Robert Kearns, chairman of the Ireland Park Foundation, showed him around, pointing to the park's stark, sculpted figures, some huddling and some reaching toward Toronto's gleaming downtown towers. They represent the tens of thousands of victims of the Irish Famine who arrived here in the summer of 1847, overwhelming and traumatizing the city. Both Mr. Kenny and Mr. Kearns were soaked, since no umbrella or suit jacket was capable of sheltering them from the overpowering rain lashing the waterfront. When Mr. Kearns introduced the Prime Minister he apologized for the weather. Mr. Kenny nodded, smiled and then said it was absolutely appropriate that he arrive soaked, cold and uncomfortable. Those whom Ireland Park remembered had arrived in Toronto in far worse shape. In 1845, when blight struck the Irish potato crop and destroyed it, Ireland was under colonial British rule and less than 5 per cent of the population owned 95 per cent of the land. The 95 per cent non-owners were Irish tenant farmers, little better than slaves, often living where little could grow except the nutritious potato. The blight struck again in 1846 and 1847. One million died of starvation. Those who could, fled. 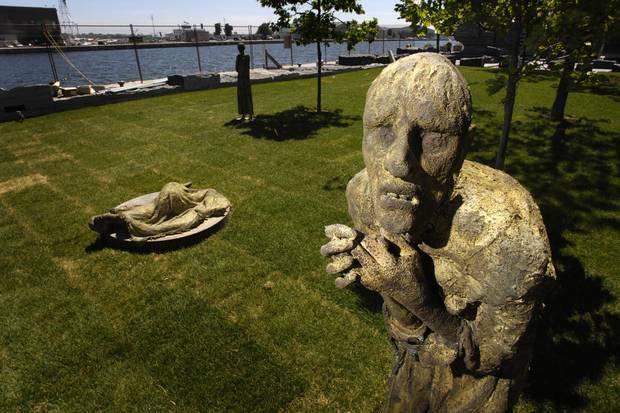 It will be 10 years this month since Ireland Park opened; a small patch of grass, almost hidden, that was created to acknowledge that in 1847, a city of 20,000 faced a tsunami of arriving famine victims. More than 38,000 arrived that summer. Almost twice the city's population. Some were sick with cholera and typhus, easily transmittable, deadly diseases for which there was no cure. An unimaginable crisis. The thing about the establishment of Ireland Park is that it was a start, not an end. The foundation kept digging into the crisis of 1847, knowing that the story has resonance today, in this age of refugees fleeing war or starvation in mass numbers, and the shock and fear felt in cities and countries overwhelmed by new arrivals. Toronto in 1847 was a small, sedate Anglican outpost, fiercely British, with an array of Protestant churches. The arriving Irish were sick, poor, Gaelic-speaking and Catholic. "No one had ever heard that a Protestant doctor had come to the aid of the famine victims," Robert Kearns says of Dr. Grasett. "What happened was a calamity for the city, and people wanted to put it behind them and forget. George Grasett was well-off and part of the establishment. He had access to every smart drawing room in the city. He could have kept walking up Jarvis Street to attend to his private patients, the wealthy and powerful. But he didn't. You could say he was the first Médecins Sans Frontières doctor in Canada. And he knew he would die helping these people." There are no images of Dr. Grasett to be found. No painting or sketch. He did what he did, and died. In 1847 he was simply a well-connected young doctor. His brother Henry James Grasett, the first rector to reside in St. James's Rectory, was made rector in that fateful year of 1847. George was well-liked, we can surmise. He had started as a family doctor in Amherstburg, Ont., and when he announced he was heading to Toronto to practise, the locals pooled their resources to pay him to stay. He did, but eventually moved and by 1842 he was part of the Toronto establishment – a member of the Bible Society, and active with the city's House of Industry, a local but more humane version of the notoriously harsh Victorian workhouses founded to house and employ the destitute. It was humane thanks to the efforts of people such as Dr. Grasett. He was also a founding member of the Toronto General Dispensary, which provided "medical and surgical advice and medicines to the indigent sick." In June, 1847, he lobbied for and was appointed to the job of chief attending surgeon at the newly opened Emigrant Hospital. God only knows what he was thinking. Dr. Grasett, you see, knew what was coming. He wasn't the only one. Michael Power, the first Roman Catholic Bishop of Toronto, had issued a warning. In an intensely Protestant city, Bishop Power was not the most popular or powerful figure, but he had foresight. In early 1847 he had left for Rome to request help from the Vatican in recruiting Catholic priests for the Toronto area and to raise funds for a Catholic cathedral in the city. After Rome, he went to London, Liverpool and Dublin. Bishop Power witnessed the first wave of famine victims staggering away from Ireland. He sent an urgent message back to his flock in Toronto: "As soon as the ice is off the lake, expect a great influx of migrants." 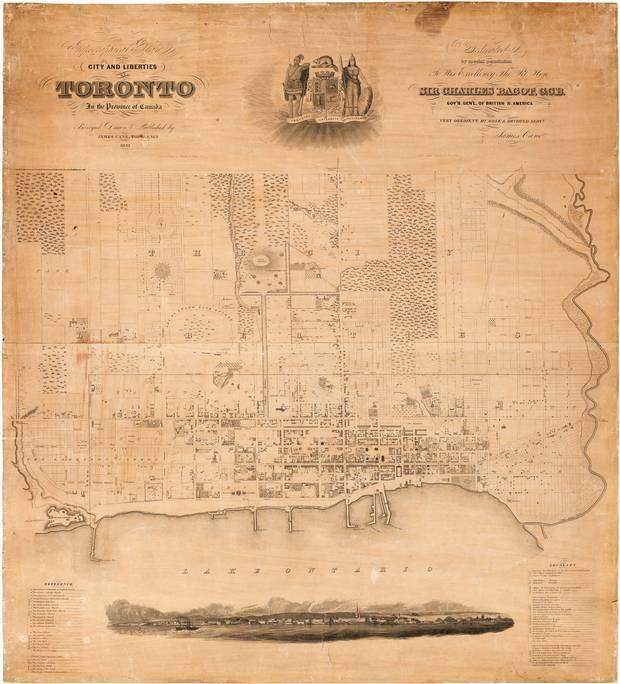 James Cane’s topographical map of Toronto, circa 1842. On June 8, 1847, the first boatload arrived in Toronto, via Grosse Île in Quebec and Kingston. They landed at a wharf where the Metro Toronto Convention Centre stands today. It was typhus-ravaged human cargo that came. Dr. Grasett knew it and the city knew it too. The city's official concern was to make sure the human cargo kept moving and that no diseased person stayed in the city. Dr. Grasett's concern was that the sick and dying receive treatment and, if they must die here, that they die in relative comfort. Six weeks after that first chaotic landing of hundreds of men, women and children in varying states of hunger, illness and weakness, Dr. Grasett was dead. He knew he would be. There was no cure for what the arriving famine victims carried if they were diseased, and treatment was limited, mainly to giving succour to those suffering dreadful fever. Death was almost inevitable. The city of Toronto was petrified, and understandably so. There were stringent regulations in place to prevent locals from coming into contact with the sick, and the arriving migrants were, essentially, forced to keep going onward to anywhere except what was then this small city. Dr. Grasett was what we'd call today a first responder. It is to the credit of Toronto that the city had a plan, incomplete and meagre though it was. Records show money was used to establish "sheds and hospital" for the migrants. Where the Dr. George Robert Grasett Park will stand is where many of the arriving Irish were treated or died. Money was spent on bread and meat to feed the sick. But who would treat them and feed them when the fatal diseases they carried were contagious? That fell to Dr. Grasett and some friends and colleagues. Death on a mass scale happened every day that summer. Almost daily another ship would arrive in the city with hundreds more of the famished and diseased. The natural human impulse is to flee such catastrophe. The impulse of institutions is to manage the situation so that it has minimal impact. What Dr. Grasett did was to surmount fear and loathing, act out of kindness and offer humanitarian service, even if those actions would bring his own swift death. Imagine that. The fact is, for a long time that crisis-ridden summer of 1847 was forgotten, erased. That's why there were no statues or plaques to honour those who acted so well, so decently. What will be unveiled when the park opens in September is tiny – 80 feet by 20 feet (24 by six metres), surrounded by condo towers and gleaming office buildings. 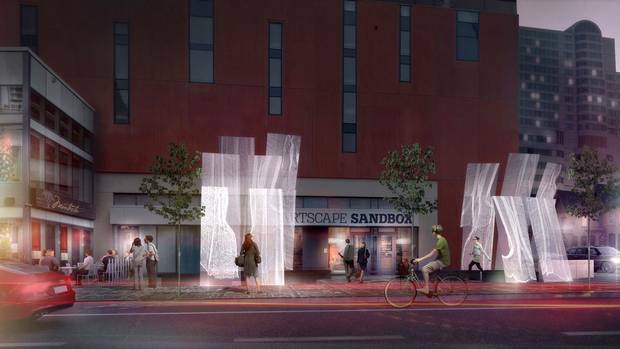 The sculptural art is not an imposition on the street corner – it is laminated glass, with printed cheesecloth patterns embedded within it. That connects to the rolls of cheesecloth it is believed were used for various purposes by Dr. Grasett and his colleagues in the fever sheds where typhus-stricken Irish migrants were housed. On the ground, in black granite, will be etched Cane's Map of the city of Toronto in 1842. There will be stone benches to sit on and, maybe, reflect on what the small space signifies – that what characterizes us, this city and country, whether we call it public health care, or common decency, is defined by what the space honours. It honours a fact that should never have been lost or forgotten and gives us hope for the future – in that horrifying, catastrophic summer so long ago, people behaved decently and took care of each other. Imagine that. 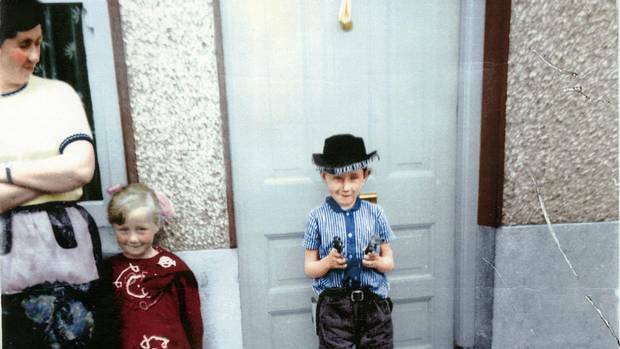 John Doyle: A century after the Easter Rising, we're ‘as Irish as we want to be’ In the camogie stands, at the kitchen table and in the pub, John Doyle talks to his parents about a bold proclamation’s many echoes. Rebecca Graff-McRae: Why the Irish question still matters for British politics The stakes are high for the future relationships between Northern Ireland, the Irish Republic and the United Kingdom.